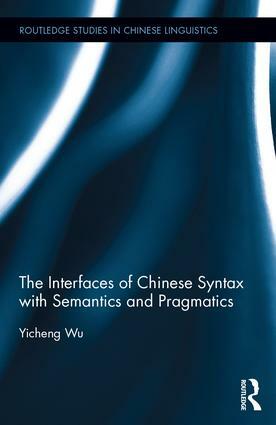 The Interfaces of Chinese Syntax with Semantics and Pragmatics provides an in-depth exploration of a variety of interface phenomena in Chinese, a non-inflectional language, where to a large extent word order constrains its interpretation and defines its grammatical functions. Under the Dynamic Syntax approach, which takes the incremental left-to-right processing of linguistic forms to be a fundamental part of characterizing the relation between syntactic structure and semantic interpretation, a straightforward explanation is provided. The study features detailed analysis of a range of key grammatical constructions such as topic, passive, copular and cleft, where previous analyses were sought in pure syntactic, semantic or pragmatic terms. Clear and straightforward throughout, The Interfaces of Chinese Syntax with Semantics and Pragmatics will be of interest to graduate students and scholars of Chinese, linguistics and cognitive science. Yicheng Wu is Professor of Linguistics at the Centre for the Study of Language and Cognition, Zhejiang University, P. R. China.